This next pair of fragrances are not like any you have experienced before and I really had to read up on them to fully understand. The line is ESCENTRIC MOLECULES. What each does is exploit Iso E Super, an aroma ingredient found in most fragrances in a small concentration. Think of this Iso E Super is a “super” base note. We’re used to having the top note first that burns off first, then the middle or heart notes, then the base, which is what lingers on the skin. Instead, this one quickly moves from the top to the bottom focusing on the sensuality of the sandalwood of the base. Another trait we are used to is a big bold smell when we first put it on. This one smells almost like nothing when it is first sprayed on but then the scent grows as the minutes tick then fades and reappears. Spooky! 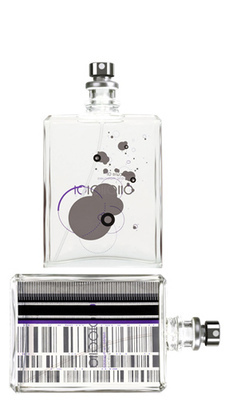 There are two fragrances in this first pair: Escentric 01 and Molecule 01. Escentric 01 claims to be almost pheromonic. Come to think of it, my dog seemed to be extra happy to see me yesterday. Molecule 01 contains still uses the super base of Iso E Super but adds other notes of pink pepper, green line and balsamic notes like benzoin, mastic and incense. I’m curious to see what this company will come up with next. $130/3.5oz each @ barneys.com.